Originally, the name of the band was Revolucija (Revolution), but after finding out that there is at least one other band with that name (but probably like billion other bands haha) we decided to just subtract a letter. Later on, we realized that this new name is something we can all relate to, because progress and evolvement is something each and everyone of us should strive to. Also, because many people today unfortunately seem to evolve in opposite direction, we would like to lead by example and progress with every album, every show and so on. Where do you draw inspiration for writing? All the members in the band had different influences throughout their musical journey and development, so ranges of music from which we get our inspiration is quite diverse, from Serbian Orthodox spiritual music, to some pretty extreme metal. In general, we are trying to stay as close to our vision as possible, and that is to make kind of melodic, catchy, in-your-face songs, but to still keep them heavy. As for the topics, those are usually some things everyone has to go through in life, like love, journey to finding your true self in spite of things that try to keep us off our path. What was the process behind writing the new album? Are there any themes within the record? To us, the vocal lines are the most important part and the first step in the process. Once we get those, it’s time for the lyrics. After that, we do things in the usual manner. Of course, we were fortunate to meet the right people who helped us make it sound just the way we wanted. As for the themes, those are our regular topics, relations between people, both in a romantic and non-romantic ways. Another would probably be timing of some events in our life, things happening when we don’t think they should happen and vice versa. Our plans are fairly simple, we want to push the band as far and as hard as possible, making songs that people can relate to, being on the road, making new friends, that kind of stuff. 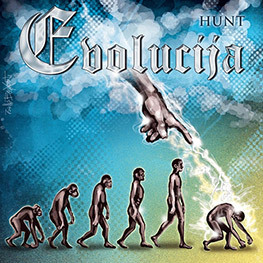 The album cover of Hunt symbolises a lot. The evolution of man and the thunderbolt from the heavens above makes one think of something far from normal. A telling sign of these strange and trying times. The music naturally reflects this. Hunt, A Rose Without No Name and Velvet Cage provide haunting melodic metal, that immediately hooks the listener and makes them truly pay attention. There are subtle twists and turns throughout these three songs that promise so much. A promise that is delivered by Poet, Reflections on a Blade and Portrait, such that as Portrait ends, the listener is eagerly anticipating more. More is delivered just as promised with stand out tracks such as How I Wish, Lonely, Remorse and the closer Metamorphosis. All of which enable the beautiful vocals of Ilana to stand out amidst the thunderous guitars and solid rhythm section. Hunt is a great album, a brilliant mix of musical styles, which truly enables the power of the music to carry through. If you are a fan of melodic metal, make sure to check this album out upon its release on March, 30th.